When you create brochures and flyers, displaying them will surely boost your business. Easy Flyer Creator can help you in this task. This can be a great help in your career. Templates: once you download the application, a list of available models will unfold before your eyes. 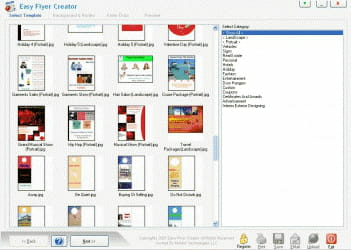 In fact, Easy Flyer Creator offers you more than 100 models to inspire you for your creations. Customization: Easy Flyer Creator also offers templates that are customizable. And in fact, you can select items and replace them, then change the colors, images, shadow and text frames as well as the police. Sharing: the results of your work can be shared with friends or colleagues so that they can give their opinions. To assist users, the results can be sent via email or FTP, depending on their choice. The software is easy to use and creations take only 5 short minutes. Convenient and useful for businessmen and marketers. It is not possible to print the results for the trial version. The full version costs $ 39.99. Latest update on December 6, 2016 at 04:51 PM.